If you objected to the planning application, you will have received a letter from Preston City Council advising you that you can make comments on the appeal by writing to the Planning Inspectorate by 22nd April. Please quote the following reference: noAPP/N2345/A/11/2145837/NWF. You can make your comments online, avoiding the necessity to submit three printed copies. See: http://www.planningportal.gov.uk/planning/appeals/online/comment. (This site opens in a new window.) You may also find the "Guide to taking part in Planning Appeals" helpful. Then click on the link indicated by the red arrow above. (The arrow does not appear on the site itself.) This opens a new page showing the basic details of the case. Near to the bottom of the page is a link with the text "Comment on this case". 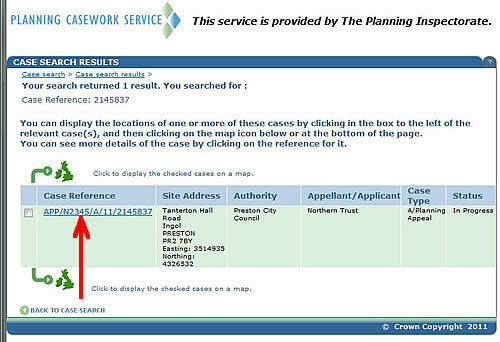 Click on this and you will find a new page entitled "Make Representation on Case APP/N2345/A/11/2145837." You then need to complete the form by following the instructions provided. It is best if you can put your comments in your own words, drawing upon your main areas of concern. Remember that the Inspector can only take into account 'material' planning considerations. Loss of a view from your back garden, or potential impact on the value of your property are not covered and will not be taken into account. In making his/her decision, the Inspector will be concerned with the wider public interest. The Council and IGVRA will major on the technical planning arguments - long term allocation as open space etc. You can help most by communicating in your own words how the loss of these lands will make the area a poorer place for all those who live here now and in the future. Whilst traffic issues are a concern and the subject of objections by the County Council, remember that these can very often be addressed by the developer undertaking or paying for additional works. If it is the principle of development on this open green space that you want to object to, then do not rely on highway and traffic concerns alone. Look at the grounds of appeal raised by Northern Trust and, where you consider they are unfounded, dispute them. For example, do you agree with Northern Trust's view that the golf course is no longer commercially viable or do you believe that it was closed for other reasons? Northern Trust claims that it tried to sell the course but no buyers came forward, thereby proving its claim that the course in not viable: do you believe that it was adequately marketed (for just 3 months) and that the terms of the contract were genuinely designed to appeal to potential buyers? If not, by all means express your doubts. Northern Trust is arguing that this land should be built upon because the course is no longer commercially viable and that house building is justified because Preston doesn't have sufficient housing land to meet its needs for the next 5 years. IGVRA's view is not simply that the land should remain protected and all efforts made to retain it as open green space for recreational use; we also believe that there are much better sites that will meet short term/medium term housing needs - sites that already have planning permission and that, in a weak housing market would be undermined if hundreds of new houses were to be built on the golf course. If we can convince the inspector that there are better, more appropriate sites to meet Preston's housing needs for the next five years at least, then even if Northern Trust is able to convince him that the course is not commercially viable, he should still recommend a refusal of the development proposals. This would leave the question of how Preston's longer term housing needs are to be met as a matter for the local authority plan-making process and would provide a further opportunity to fight for the long term protection of the land. Copyright 2011, Ingol Golf Village Residents Association.